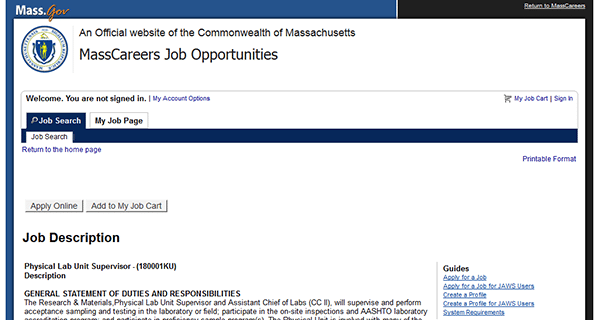 Use the various links posted on this page to access the official MassDOT job application online. Numerous types of careers can be searched/applied for via the company’s online careers site. Learn more about the online application/hiring processes by following the steps in the guide posted below. The company’s careers webpage allows you to search for current job openings, learn more about the types of positions that are available, as well as apply for numerous careers. About the Company: MassDOT is the Massachusetts Department of Transportation. The organization manages the state’s transportation services. It was formed in 2009 and has more than 1,500 employees across numerous career categories. 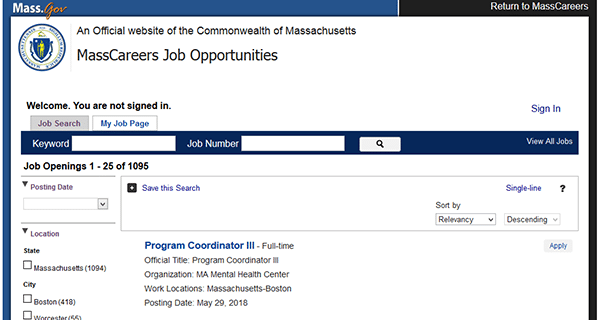 Step 1 – Begin the online MassDOT job application process by going to the state’s main employment search page. Click here to open the page in a new browser window/tab. You can also hit the blue button at the top of this page to go directly to the search website. Step 2 – Type “MassDOT” into the keyword field and then hit the search button to load the list of current MassDOT openings. Step 3 – Press the title of the position that you want to submit an application for. Step 4 – Review the various job description sections and then press the button as outlined in red in the below image. Step 5 – Continue to follow the on-screen/page instructions, providing any/all required information. Step 6 – Review and submit the application.